The 25 Hours of Thunderhill is one of America’s longest, craziest grassroots road races, attracting crazy fast club racing cars ranging from Spec Miatas and Porsche Cayman GT4 Clubsports to full-on racing prototypes. Oh, and there’s a Studebaker Champion out there sharing a track with Norma prototypes, and it’s perhaps my favorite thing. This isn’t the Studebaker’s first race, as it’s competed in La Carrera Panamericana before, where it fits right into the vintage-cool aesthetic of that classic road race. Yet it’s one thing to take classic American iron out to a vintage or Lemons race where it’s among other cars like it. 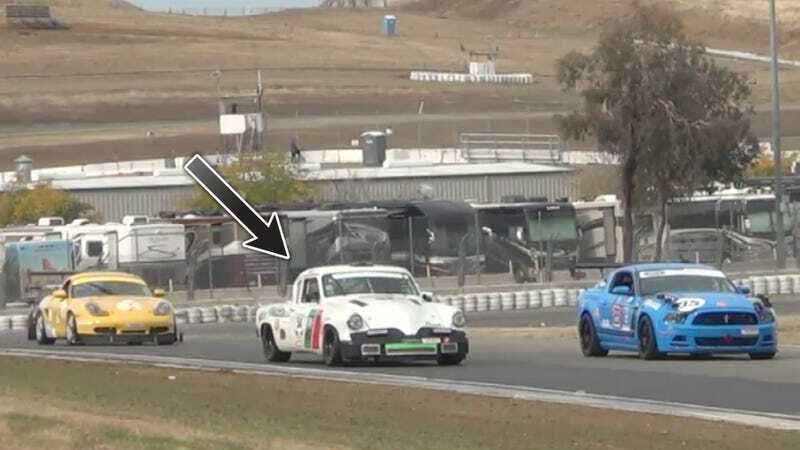 Taking it to the 25 Hours of Thunderhill is a another level of admirable insanity. The No. 54 Studebaker LCP Racing team is properly quick so far, holding their own against much newer cars running in the E0 class, which includes everything from the tube-frame Mitjet LV02 EXR Series car to race-prepped BMW M3s and Honda Civics. They’re in fifth place in the gargantuan E0 class at the time of this writing, and by far the prettiest car on track. UPDATE [12/3]: The Studebaker was sidelined by a bad ball joint for a while, but was ultimately able to rejoin the race to take the checkered flag, finishing 45th overall with 342 laps but importantly: still finishing. New record holders and 2017 winners Flying Lizard Motorsports. This was the longest-ever 25 Hours of Thunderhill by distance thanks to unusually agreeable weather, with overall winners Flying Lizard Motorsports completing 780 laps in their Audi R8. The previous record of 761 laps was set by Mercer Autosport in 2009, and this year’s field broke that with 53 minutes to go. Wow.